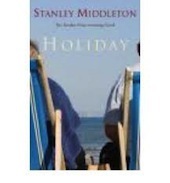 Posted on January 18, 2014, in Book Reviews and tagged Man Booker Prize, Stanley Middleton. Bookmark the permalink. 20 Comments. I am Stanley Middleton’s literary executor and keen to keep his name and work alive. This year is the centenary of his birth, and there will be events in Nottingham,. including the launch of a selection of his poetry. That’s great to know Philip. Are they recent issues? A few years back Sam Jordison of the Guardian (and now also of Galley Beggar Books) did a column where he read past Booker winners. This was his big find. He hadn’t heard of Stanley Middleton, wouldn’t have picked up the book if he hadn’t been writing the column, and then spent the column talking about how much he loved the book and how remarkable it was that it had slipped from view. It’s been on my radar since, and here you are saying essentially the same thing. It is curious how some books so plainly deserving can yet be forgotten, while others often less meritorious somehow achieve fame. Anyway, thanks for the review as it reminds me to try this myself. It sounds small and quiet and well done, and that’s difficult to pull off but rewarding since much of life is small and quiet – there are those who live constantly in a whirlwind of drama, but most I think find that rather fatiguing. i enjoy Sam’s reviews. He writes knowledgeably but without sounding like a professor or someone who is desperate to show off how much more he knows than I do. It’s so unfortunate that Middleton was the subject of that stunt where his book was sent anonymously to literary agents to test who would publish it. I picked up a copy of this in a charity shop some time ago, but haven’t been inspired to read it – I’m glad to hear that it was worth reading, and I like the sound of the ‘authenticity’. I’ve heard of him only because of the Booker Prize, and I haven’t seen any of his works in our book stores. I hope to find a copy of this because you make it seem interesting to me. I have wanted to read this for years, but you are right I don’t think I have ever seen his books in the shops. It’s a funny idea, isn’t it, that someone might have (as we’re all supposed to) just one novel in them, but that that novel might be a Booker winner? I’ve never heard of him either. Goodness knows how many writers there are out there like Middleton. Nice to unearth a gem though.